Pryer Technology Group, Tulsa, OK, manufacturer of Triform sheet-hydroforming presses, introduces two new tray-style presses designed for aircraft-parts production. Triform presses use high-pressure hydraulic fluid in a flexible rubber bladder to form sheetmetal using a single tool, producing parts in a range of complex geometric shapes. The line was developed and launched in 2008 to replace the original sheet-hydroforming equipment made in the 1960s and 1970s, which can be plagued by high maintenance costs, frequent downtime and limited availability of replacement parts, say Pryer Technology representatives. 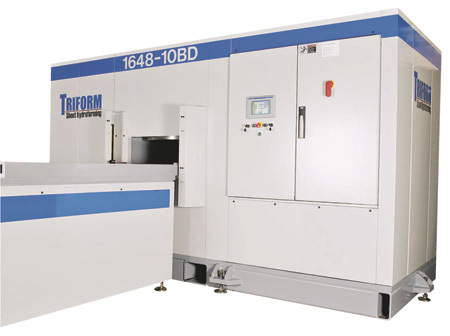 The two new Triform presses include the Model 1648BD, with a 16- by 48-in. work envelope; and the Model 2448BD, with a 24- by 48-in. work envelope. Both presses deliver standard pressure to 5000 psi, with Model 1648BD also available with 10,000-psi capacity. Triform presses are compact and portable, and most models have no special flooring requirements. Their state-of-the-art hydraulics and advanced touchscreen controls can optimize part quality while reducing material and labor costs. The presses come in 10 different models, including those equipped with a hydraulic punch cylinder to allow forming of deep-drawn parts with depths up to 13 in.